Facades United fills a unique need in the market by being able to bring together numerous high-performance wall cladding products. We are now able to deliver quality products that have either lacked suitable installation solutions for the North American market or the means to effectively provide installers with technical support and pricing to successfully pursue projects. In recent years, facades have become less dominated by a single material, as newer design trends now dictate that multiple materials come together to express a singular idea. Facades United’s attachment systems allow for traditionally different materials to integrate into a singular system or series of compatible systems to offer designers the freedom to bring their unique vision to life. 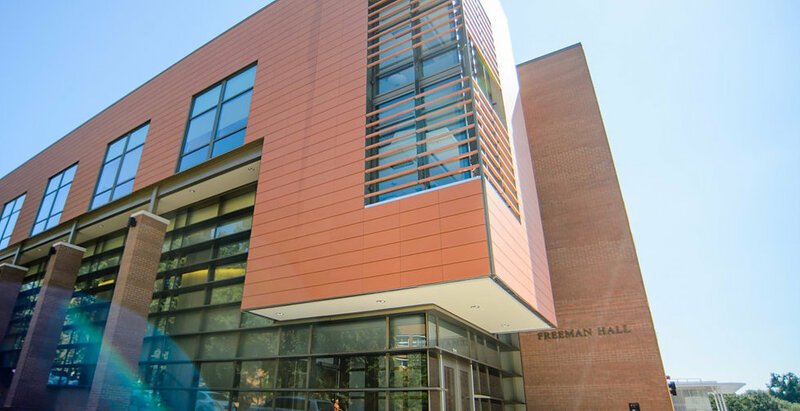 Facades United designs, manufactures, and supplies fully-engineered rainscreen systems for high-performance exterior cladding products. Based in Austell, GA, Facades United is focused on providing support for installing subcontractors from bidding through installation while also serving the design community: architects, designers, specification writers, and engineers. The company has taken a unique approach to service the North American market by designing its own highly-engineered attachment systems systems designed to accommodate material from multiple manufacturers. Facades United provides architects, designers, and specification writers with maximum design flexibility for any type of project. BladeScreens™ architectural louver screens can be used in a variety of applications where a sight barrier is desired. It features a horizontal blade that creates a visual barrier when viewed straight ahead or from below. This visual barrier also conceals vertical supports and attachment clips. BladeScreens, an inverted horizontal blade, is secured to a receiver clip that is mechanically fastened to a continuous vertical support member. The blades are available in fixed member depths with a variable member-to-member spacing. Prefabricated corner assemblies are available in mechanically fastened and welded configurations. Each blade shall be extruded 6063-T5 aluminum and shall be spaced at a frequency to accommodate the desired visual barrier. Design options are virtually limitless with three finishing options and a multitude of colors and appearances to choose from. DEKTON stone cladding panels, manufactured by Cosentino, offer design flexibility with large format panels within an engineered rainscreen facade attachment system designed by Facades United. The DEKTON panels are extraordinarily durable with 33,000 psi of compressive strength and less than 1.0 percent moisture absorption rate. These panels stay cleaner longer than natural materials and are available in a wide range of colors. PlankPanels™ featuring FunderMax Exterior F-Quality High Pressure Laminate (HPL) material is a prefabricated HPL rainscreen cladding system. With four layout styles and the most extensive color selection currently available on the market, PlankPanels provides endless possibilities allowing architects and designers, as well as building and homeowners, to let their imaginations run wild. 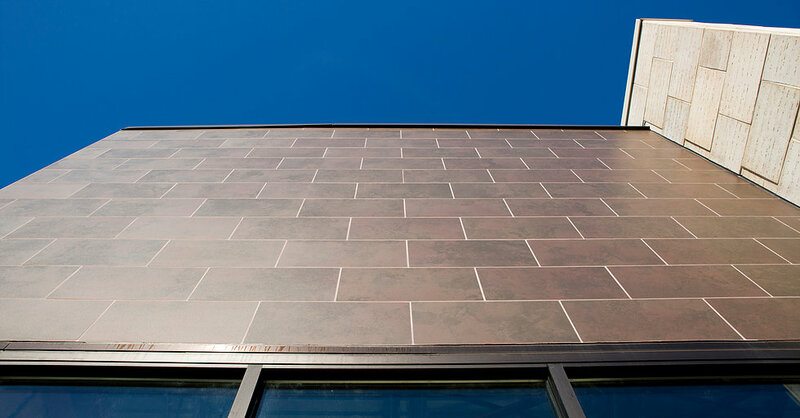 PlankPanels featuring FunderMax is a HPL rainscreen cladding system designed for fast installation for a lower in-place cost than traditional HPL rainscreen systems. PlankPanels are available in all Fundermax Max Exterior F-Quality colors, offering a wide range of possibilities with over 115 colors to choose from. Available for both exposed and concealed attachment systems, PlankPanels can be installed above 40' using the concealed attachment system and lengths are available up to 161". Facades United’s approach to offering terracotta is different from other manufacturers or distributors. Unlike the traditional distribution model used by companies who split responsibilities between multiple companies on multiple continents, Facades United offers an attachment system that will accommodate tiles from multiple manufacturers. Using only the finest tiles from international suppliers, including Ceramica Mayor of Spain and Palagio Engineering of Italy, Facades United delivers a nearly unlimited set of design options for the architect. The combined portfolio from our terracotta partners enables us to offer the widest range of colors, textures, glazes, and custom profiles in the industry from a single source. Our engineered subframing systems are manufactured here in the United States and designed to accommodate virtually all substrates, thermal requirements, and project challenges, making it the most versatile terracotta system on the market.